Available from duo to quintet. 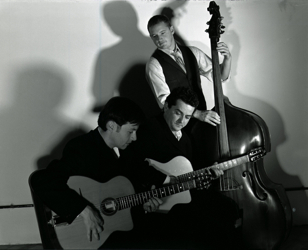 Ultraswing is one of the UK's longest-running gypsy jazz groups. The core of the group is two guitars and double bass, but this can be built upon by adding violin, clarinet, sax, accordion or more guitars. The band evolved from The Hot Club of Hassocks, briefly appeared as The Dukes of Hassocks, and settled down as Ultraswing in 1995. The music is unabashed gypsy swing from the Django Reinhardt era, and many previous clients have been tapping their toes to the infectious sound. Ultraswing originally formed in 1995 and consisted of leader Matt Guez on rhythm guitar, solo guitarist Jonny Hepbir and double bassist Dan Sheppard. Since then they have played countless gigs at weddings, corporate functions, parties, clubs and restaurants. 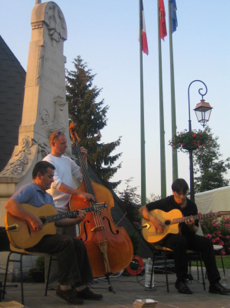 They have also embarked on many tours of France, the motherland of gypsy jazz guitar. 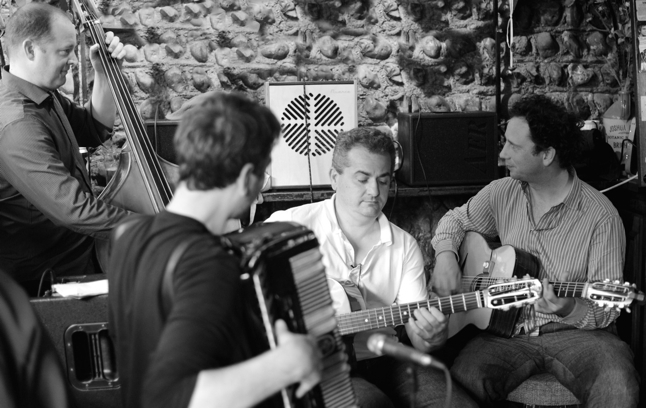 Most years you can catch them at the Samois festival, held just outside Paris on the island where Django Reinhardt lived. Many consider this the spiritual home of gypsy jazz music. Ultraswing has many corporate clients, including Mercedes Benz and PricewaterhouseCoopers, plus countless happy wedding clients – their testimonials are always positive. The band supplied gypsy jazz for New Years Eve and Boxing Day at the Ashdown Park Hotel many years running, and another run of regular gigs at The Intercontinental on London’s Park Lane was a great success. Many of Ultraswing’s clients choose to augment the group with additional instruments. The band is available in many formats: a duo of two guitars; add double bass for a trio; add clarinet, vocals, violin, accordion or sax for a quartet; add any combination of the above for a larger group.